My first encounter with Silvina Ocampo’s work came in the shape of Where There’s Love, There’s Hate, a novella she co-wrote with her husband, Adolfo Bioy Casares. This playful take on the traditional murder mystery genre made my 2014 end-of-year highlights, so I’ve been looking forward to reading Thus Were Their Faces, a collection of Ocampo’s short stories published earlier this year. In her introduction to this collection, Helen Oyeyemi informs us that the panel of judges for Argentina’s National Prize for Literature deemed Ocampo’s body of work to be “demasiado crueles” meaning “far too cruel” and so they denied her the prize. While it’s true to say that several of these stories feature rather sinister events, I’m not sure I would simply label them as “cruel”. They’re far more interesting than that, a point I hope to demonstrate in this review. Faces contains forty-two stories drawn from seven different collections of Ocampo’s writing published from 1937 to 1988; the pieces vary in length from one or two pages to longer works. Several of the pieces throughout the collection feature individuals who possess the ability to see into the future, an unsettling sense of clairvoyance that often arouses suspicion amongst those around them. In one of my favourite stories, Autobiography of Irene, a young woman describes how she foresaw her father’s death three months before it happened. This clever, beautiful and moving piece ends with a development that brings Irene’s story full circle, one that made me turn back to the beginning to read it a second time. The supernatural crops up again in The House Made of Sugar, the first of several excellent pieces taken from Ocampo’s 1959 collection, The Fury. In this disquieting story, the narrator tells of his partner, Cristina, a woman whose life is governed by superstitions. Finally, the narrator finds what he hopes will be the ideal place: a little house that looks as if it is made of sugar. On discovering that the house had been occupied in the past and subsequently remodelled, he decides to keep quiet and let Cristina believe that their home is brand new. But once the newly-weds move in, the narrator starts to notice certain changes in Cristina’s behaviour. Slowly but surely she begins to inhabit another woman’s life, that of the mysterious Violeta, the previous occupant of the house. In The Photographs, a fateful little story from the same period, Ocampo shows her talent for taking what should be a joyful celebration and injecting a touch of the macabre into it. Recovering from a stay in hospital and unable to walk unaided, Adriana is allowed home for her fourteenth birthday party. As they wait for the photographer (Spirito) to arrive, the guests entertain themselves with ‘stories of more or less fatal accidents. Some of the victims had been left without arms, others without hands, others without ears’. Members of the family jostle and position Adriana for a series of photographs, moving and manipulating her as if she were a rag dog. As the story unravels, there is a striking contrast between the sugar-coated sweetness of the occasion and the insensitivity shown towards the young girl. In the third photograph, Adriana brandished the knife to cut the cake, which was decorated with her name, the date of her birthday, and the word “Happiness,” all written in pink icing, and covered with rainbow sprinkles. “She should stand up,” the guests said. The Velvet Dress, touches on another contrast: the dual nature of velvet, a fabric that feels smooth when rubbed one way and rough when rubbed the other; a fabric with the power to repel as well as attract. This story features a woman who is having a dress made-to-measure, a velvet dress featuring a dragon motif embroidered with black sequins. Mimoso: a sinister story of a woman who has her beloved dog embalmed following its death. But when someone taunts and criticises her for doing so the woman takes her revenge in the most fitting way possible. The Perfect Crime, in which a man commits a crime of passion involving poisonous mushrooms. The Lovers, which features a couple who meet sporadically. Shy and with little to say to one another, they indulge in a ritual of picnicking on cakes. As they devour the pastries with ‘loving greed and intimacy’ they find a way to commune with each other and their movements become synchronised. They were also linked by the violence of their gestures, by their simultaneous laughter, by a boisterous and sudden feeling of sadness in solidarity hidden in their eyes, in their straight or slightly curly hair. So indissolubly united were they that they could defeat an army, a pack of hungry wolves, a plague, hunger, thirst, or the abrupt exhaustion that destroys civilizations. Several of Ocampo’s stories blur the margins between reality and the imaginary world. One of the earliest stories, The Imposter, demonstrates this to good effect. In this extended piece, the young man who narrates the story is sent on a journey by a family friend to check up on his son – the boy has hidden himself away at a secluded ranch in the countryside. When the narrator arrives, several objects and people remind him of things he has seen before: images, people and scenes from his dreams start to appear in reality; strange developments occur; and as the story progresses, one begins to question what is real and what is illusory. This is another story featuring a shift that will have you flipping back to the beginning to read it again. Some of Ocampo’s final stories are characterised by a free-spirited wildness, possibly the product of an especially vivid imagination in the years leading up to her death. Others are gentler, tenderer pieces such as And So Forth, which features a man who falls for a mermaid. This beautiful, mystifying story reads like a prose poem, an ode to a different kind of love. I love the stories in Thus Were Their Faces, the way they often start in the realms of normality and then tip into darker, slightly surreal territory. Several of the pieces point to a devilish sense of magic in the everyday. Ocampo studied painting with the Italian artist Giorgio de Chirico, and this flair for the artistic shows in her prose which sparkles with strange and mysterious imagery. This is an unusual and poetic collection of stories – highly recommended. Thus Were Their Faces is published in the UK by NYRB Classics. Source: personal copy. Book 9/20, #TBR20 round 2. 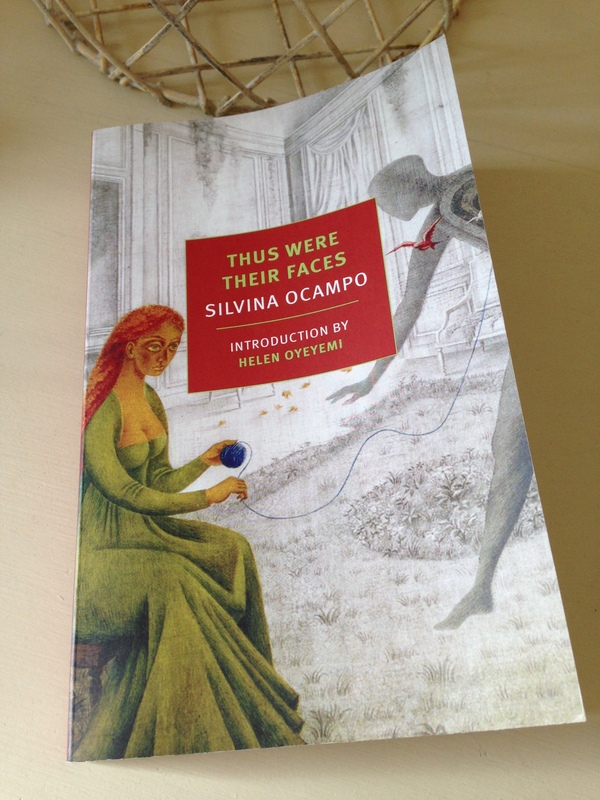 This entry was posted in Book Reviews, Ocampo Silvina, Women in Translation and tagged #ReadWomen, #TBR20, #WITMonth, #WomeninTranslation, Argentina, Book Review, Fiction, Literature in Translation, NYRB Classics, Short Stories, Silvina Ocampo on September 2, 2015 by JacquiWine. Oooh, excellent review Jacqui – and fortunately this is lurking on the TBR. I have in fact got as far as starting The Imposter then I got distracted – obviously I need to pick this one up soon! What an odd reason to deny a literary prize, especially when you consider some of the other, sometimes bizarre, literature that comes out of Argentina. I love the quotes you included in your review; they certainly make me want to read this collection. I found it a little bizarre I must admit. It happened in 1979, so perhaps in was something to do with the time or the make-up of the judging panel that year. I don’t know enough about the history of Argentine literature to give a view, but it does sound as though she was robbed. Her stories do contain elements of the fantastic, and some of them are quite sinister, but that’s not uncommon in literature. Just think of the rich history of darkness in fairy tales and suchlike. I’m glad you like the passages I selected – her stories are eminently quotable! “genre,” in the same way Robert Aickman’s masterly “strange stories” were generally relegated to the ghost story pigeonhole. His work transcends genre and stands with the best of what is accepted as “literary” fiction. I had been curious as to when this happened, and your comment magically appeared! In 1979, Argentine Army General Jorge Videla was three years into his rule after the 1976 coup. The “Dirty War” was raging. Perhaps it was Ms. Ocampo’s clairvoyance, more than anything “cruel” in her work that caused problems. The very air of Argentina was suffused with cruelty at this time. Could this be a fascistic instinct that Ms. Ocampo’s sensibility was one that would see through and call them on their actions? I am also curious as to whether she was out of favor with the post-junta military elite. An author to be read, indeed! It’s interesting you mention genre as this may have had something to do with it. Once again, I’m drawing on Helen Oyeyemi’s introduction here…Ocampo was also a poet and by 1979 she had already won a number of notable prizes for her poetry. There’s a suggestion that her visions and dislocations of perspective were a little more acceptable in this arena – more “orthodox” if you like. Short stories, on the other hand, were another matter. Moreover, some of Ocampo’s stories have the effect of “tripping you up and leaving you on the floor”. It’s possible the judges were expecting some kind of balance to be restored (or to be within reach) by the end of these stories, and that isn’t always the case here. Your comments on the culture and mood of the period are very interesting too, and I can see how it could have played a part. Either way, it’s wonderful to see this collection in print – I’m delighted to have discovered these unusual stories. Yes, it’s an interesting hypothesis, and fiction can often hint at these things. Your comment reminds me of Carmen Laforet’s novel, Nada, a story set in Barcelona in the years immediately following the Spanish Civil War. The novel’s mood/atmosphere really seems to reflect the turmoil and destruction of that period. I think I may have recommended it to you before, but it’s definitely worth a look. Hi Jacqui, I loved Ms. Hill’s perceptive comment, and your own reference to Carmen Laforet’s novel (the TBR pile is starting to groan and creak!). The idea of a “wounded” country resonates with me, and reminds me of the dynamic sometimes encountered when writers touch too closely to wounds within their own dysfunctional families, who are more interested maintaining a “sunny” facade. Haha! I am so with you on that. My wishlist is awash with NYRB and Pushkin Press titles. How interesting that she was denied the prize. I wonder if it had anything to do with gender expectations? Maybe the judges thought the stories were too ‘cruel’ for a woman to have written? Maybe the idea that a woman wrote such irreverent and playfully sinister stories was confronting for them? I like ‘sinister’ when it’s surreal, so I’ll be keeping an eye out for this collection. Thanks for the excellent review, and for sharing the enticing quotes. It seems to be a good translation too, which is always a big bonus. Well, I’m delighted Ocampo’s stories have been returned to us in all their sinister, dreamlike glory! I’m glad you enjoyed the quotes – her prose is quite luminous at times, and the translation is a joy to read. Let me know your thoughts if you do pick it up, I would love to hear. I had a similar thought. Would too cruel have been a criticism laid against a man? Impossible now to know, but one has to wonder. Yes, I’m left wondering how things might have panned out had these stories been written by a man. The cultural/political climate at the time may well have played a part as well. As you say, it’s impossible to know for sure, we can only speculate. These stories sound intriguing. A little darkness can really add interest to a tale. As for cruelty, unfortunately in the world that we live in, I do think that art sometimes needs to shine light upon it. Thanks, Brian. I agree with you on both counts. These things are part of our human psyche whether we like it or not, and fiction can help us understand the underlying psychology. Intriguing is a good way of describing Ocampo’s stories – some of them are rather strange and puzzling but always intriguing! I echo the thoughts inscribed here. It seems strange to deny a literary prize for it being “cruel” when from what I can see from your quotes and description, Ocampo was just playfully gothic. Nothing gratuitous here. Aaaaaand, you really sold this book to me. Will keep an eye out for it, even if NYRB books are super hard to come by where I live. Hurrah! Well. I do hope you manage to track it down as these stories are rather special. I read them as dark, surreal tales – “playfully gothic” is a great description. It’s the way they slip into dreamlike territory that makes them feel sinister rather than cruel. If these stories were 100% realist fiction, I could see why they might be deemed somewhat cruel, but the addition of the illusory elements changes things. I found them quite beguiling! Based on your description, there is a very early Neil Jordan movie, “The Company of Wolves, ” that you might enjoy. Similarly dark and surreal, based on traditional fairy tales. Best film of its type I’ve watched. Came out in the mid-80’s. Oh, I love that film! It’s been such a long time since I last saw it, so I shall have to watch it again. And yes, I think there are some similarities between The Company of Wolves and certain elements of Ocampo’s stories. Thank you for the reminder. Great review, Jaqui. Like the other’s I’m surprised she didn’t get the prize. I love the title House Made of Sugar. I think they all sound terrific. Thanks, Caroline. I’m really glad you dropped by as I think you might like Ocampo’s stories. Also, I would be fascinated to hear how you think she compares to someone like Angela Carter. I haven’t read enough of Carter to form a view, but I wonder if there might be some parallels between her work and Ocampo’s. I don’t know if you’ve read anything by Yoko Ogawa, but some of Ocampo’s stories reminded me of her writing, too. Her titles are great – others include: A Doll’s Secret Memories; The Music of the Rain; Cornelia Before the Mirror. They create vivid impressions in the mind. Yes, I can see why this book might not work if you’re not in the right mood for these stories. Also, The Imposter (one of the first and longest pieces in the collection) is rather confusing at first. A second reading really helped, but you have to be in the zone for that one. When you return to this book, I would suggest you skip The Imposter (and possibly Autobiography of Irene as well), read the rest and then go back to those two at the end. Her other stories are easier to get into. You’re right. I stumbled on The Imposter. I’ll take your advice. Start with the stories from The Fury (first up, The House Made of Sugar) – that should be an easier route into her work! These stories sound great and I’ll be sure to get my hands on them. The way you described them they reminded me a bit of Horacio Quiroga’s collection “Cuentos de amor, de locura y de muerte”. Have you read them? I think you might enjoy them. I’m strongly reminded of the blacker fairytales, especially in the stories you describe about cutting off feet, living in sugar houses. Something of an irony that Argentia, of all places, should object to cruelty in stories! But that was then and this is now, as they say. Yes, I read them as darkly surreal dreamlike tales – they are very much in that style! The objection to cruelty is somewhat ironic. I don’t know if you saw Maureen Murphy’s comments on the political environment in Argentina at the time, but I do wonder if it might have had something to do with Ocampo being denied the prize. If you scroll up, you’ll see her comments. It’s the 9th comment down. What an odd collection, these flashes of magic and cruelty. But then when one thinks of other 20th century Argentine writers, that seems not entirely atypical. One might make similar observations about Cesar Aira, Leopoldo Lugones, or Manuel Mujica Lainez – so I suppose Ocampo fits squarely into that Argentine Literature of Doom. Maureen’s comment above about Ocampo’s “clairvoyance” with regard to the dark political turn in Argentina seems particularly interesting, and I wonder how much they may express something of the political atmosphere of Argentina. Regardless, thanks for hinting at what’s going on in these stories; I’m intrigued by the collection and expect to turn to it when I get a chance. It’s a very intriguing collection, and I’d love to see your take on Ocampo’s stories. She studied painting under the Giorgio de Chirico, an artist whose work influenced some of the surrealists, and I think it shows in her writing. These tales are packed with mysterious, dreamlike imagery. Yes, Maureen’s comments on the political environment in Argentina are very interesting. As you say, some Ocampo’s stories may well reflect the mood and culture of the time. I really must get hold of this – it sounds great. I didn’t realise it had quite so many stories in it! The idea of them starting normally and the tipping into ‘darker, slightly surreal territory’ is exactly what appeals to me. I know – it’s a bumper edition! Some of the stories are very short (only 1 or 2 pages in length) but somehow they work very effectively. The shape of these stories and they way they tip into darker, dreamlike territory reminded me a little of some of Alois Hotsching’s stories in that Peirene collection, Maybe This Time. I think you liked that one as well, Grant? In any case, I’m pretty sure you’ll enjoy the Ocampo, it’s right up your alley. Yet another review of a book that you make seem irresistible: you do realize, don’t you, Jacqui, that you’re making havoc of my reading plans? Haha! Well, this collection is rather special – it’s a good one for dipping into every now and again. I could imagine some of Ocampo’s stories working very well as short films, especially as they’re so strong on imagery. I’m delighted to see this review. Like you I loved Where there’s Love, there’s Hate and so I was excited to see this collection. It sounds marvellous, and fascinating, and provoking which is a range of good things to be. I was reminded slightly of Roald Dahl in places, though in perhaps a subtler and more literary way (Dahl for me was a great children’s writer and a fair writer for adults). It does sound a great one to dip into from time to time. Thanks as ever to NYRB Classics, and to you for the review Jacqui. Hurrah! I’m glad you enjoyed the review, Max. Yes, all credit to NYRB Classics for publishing this collection. It’s been curated with real care and attention – that’s very evident from the Introduction (of which there are three, including one from Ocampo herself) plus the translator’s personal afterword. Funnily enough, Balderston mentions the fact that Ocampo insisted they chose her cruelest stories when compiling this collection. I hadn’t thought of a comparison Roald Dahl, but I think you might be onto something there. Shades of Dahl’s Tales of the Unexpected, but subtler and more literary versions – yes, that’s a good of thinking of Ocampo’s stories. Perfect reading for the Halloween season. Great review. This book had been on my TBR for a very very long time. And I did not even know much about it except that it has stories of magical realism which is one of my favourite genres. I wanted to recheck some reviews to make sure it is not a bad buy and went onto Goodreads and followed the link here. I feel so happy that you loved the book. I am definitely gonna get a copy. That’s great. I really hope you enjoy it. I have to admit that I’m not a big fan of magical realism – in fact, I’m not sure I would define the book quite in those terms. Nevertheless, there is a strong sense of the mysterious, sinister or supernatural in several of these stories. I found them utterly beguiling – they conjure up the most fabulous images in the mind. Thanks for the heads up. I hope I will enjoy the stories, magically realistic or not. They do seem fascinating.